Yes, I’m back after being absent yesterday (not like anyone noticed) but I thought I’d share my favourite nail polishes as y’all know I have mine constantly painted. I’m really appreciating pale lilac and grey shades at the moment, so Nails Inc Gel Effect Polish in Porchester Square has been high on my list. I really love the finish of this polish, as it stays chip free for such a long time and looks so shiny. The colour is beautiful too! If I’m leaning more lilac, I’ll choose Essie Go Ginza, which is has such a creamy look to it which I love! Another cooler tone I’ve been liking has to be Ciate Pepperminty, as it’s the most perfect errr, mint shade. It’s really bright on the nails and looks so fresh. Perfect against a tan and the finish is really great too! I really need to try some more Ciate nail polishes as I’m really impressed with the ones I have so far. If I want bright shades, I’ve recently been opting for yellow and pinks. For yellow, the amazing Topshop Totally Tumeric (sold out online, but still in shops!) is a must have choice. It’s so vibrant and adds such a great cliche pop of colour to the nails. One of my favourite pink shades is Essie Watermelon, as it’s not too in your face, not too dark and is such a juicy shade. I adore it and it’s one I often reach for when I don’t know what to put on! So they’re all of my current picks for nails. 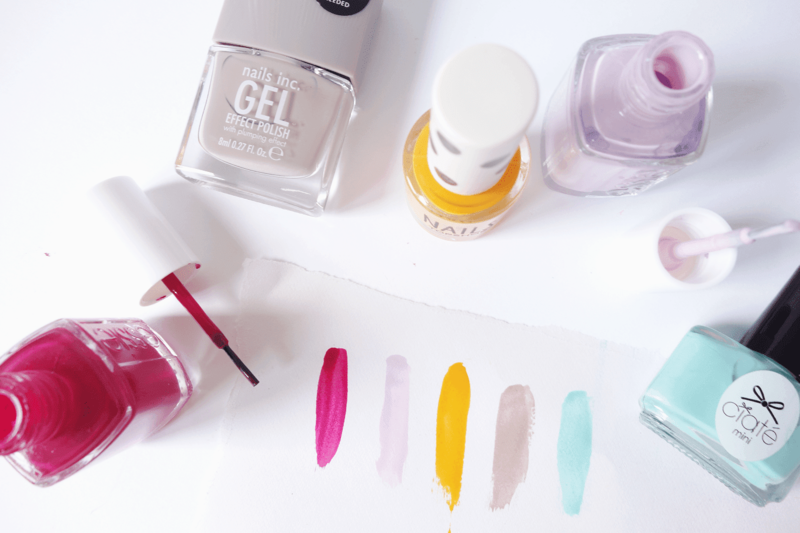 Think I’m off to paint mine in Porchester Square after I finish writing this post… Any nail shades you’re coveting at the moment? Make sure you’ve entered my £250+ beauty giveaway!